We take the protection of our customers’ data very seriously. While this has traditionally meant putting great security systems in place and ensuring that we partner with industry leading service providers, we realize that some of you have a need for us to go beyond just giving you our word, so we went out and got some certification. We already follow globally recognized best-practices, which means you can rest assured that your intellectual property, customer lists, product information, deal information, in fact, all your sales information is in great hands. 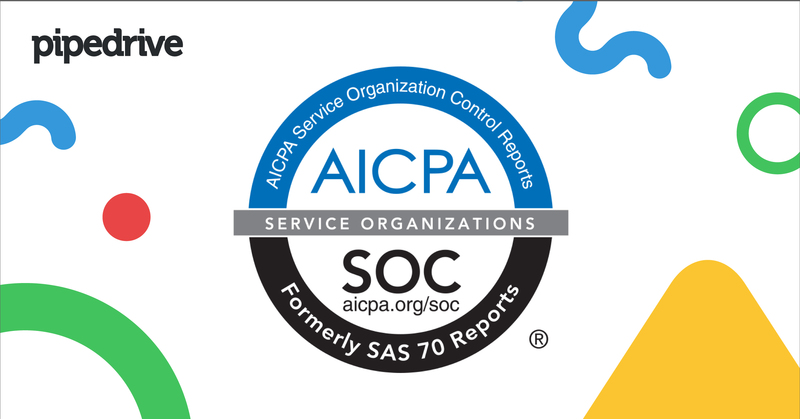 Now we are proud to say that Pipedrive is also a SOC 2 Certified Service Provider. If that sounds like we just randomly threw some numbers and letters together, read on. Security: All parts of the system are protected against unauthorized access. The relationship we have with you is built on trust, and this certification is our way to bolster that trust and work towards earning rather than expecting it. “At Pipedrive we believe your privacy and the security of your information is a fundamental right. Our culture ensures that every member of our team preserves and respects what has been entrusted to us by you, our customers,” - Pipedrive Information Security Manager Jesse Wojtkowiak. Of course, safety is an ever evolving concept in the digital world. We are currently making preparations to complete SOC 2 Type II keeping pace for GDPR compliance and ISO 27001 certification, and once that is done we will look at improving even further. Behind the scenes, we will keep examining how we build and run Pipedrive to ensure that we always have an eye on protecting you and your data.